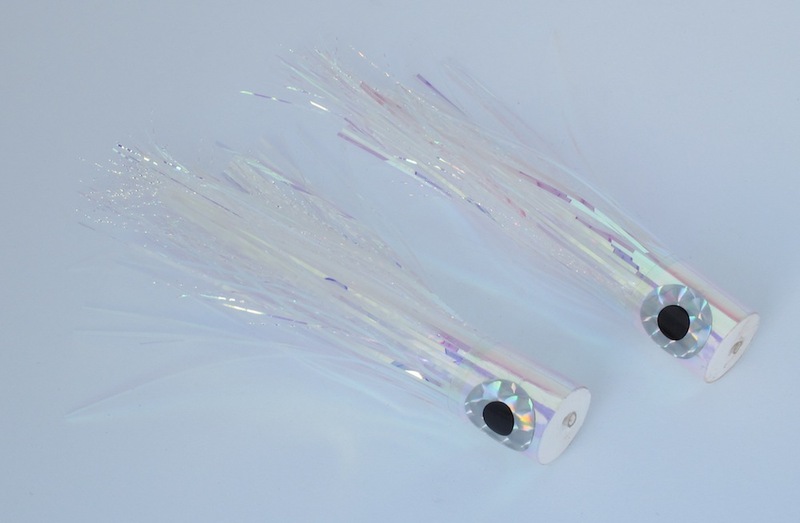 The "Bluewater Mirage" tube popper is a killer popper for heavy inshore and light offshore fly rodding. This is a top pattern for GT's - Giant Trevally, in locations like Christmas Island, the Seychelles, and elsewhere. Other heavy-hitters like tunas, sailfish, mahi, and other medium-sized offshore fish will crush this bright fly. Inshore, this popper will clobber stripers in the rips and slammer sized bluefish, not to mention bruisers like Jack Crevalle, Amberjack, and more. This fly is so bright, it has to be seen to be believed - click Here for an alternate view of the Opal color. The "Opal" color is shown in the photo above - see below for photos of the Green Machine and Think Pink colors. Save a couple bucks and get the multi-pack quantities. 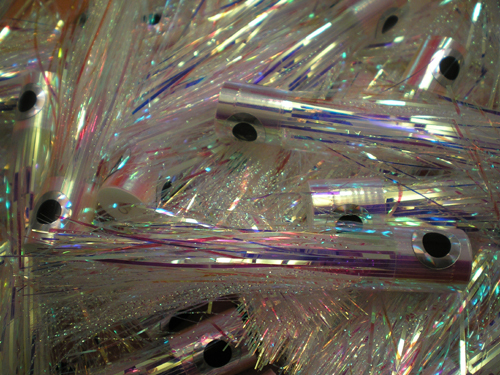 Please note that like most tube flies, hooks are not included with these poppers, as many anglers rig their own. Available separately are trailer hooks pre-rigged on heavy monofilament; see below for available configurations & specs. Supply is limited. Note: Our shock tippet rigs feature about 24" of shock tippet material snelled to the hook. The standard #4/0 | 80# hook & shock tippet rig should be adequate for most inshore fish up to 40# or so, but if you expect to run into big-game bruisers over the 50# mark, the hooks rigged with 100# test are highly recommended. 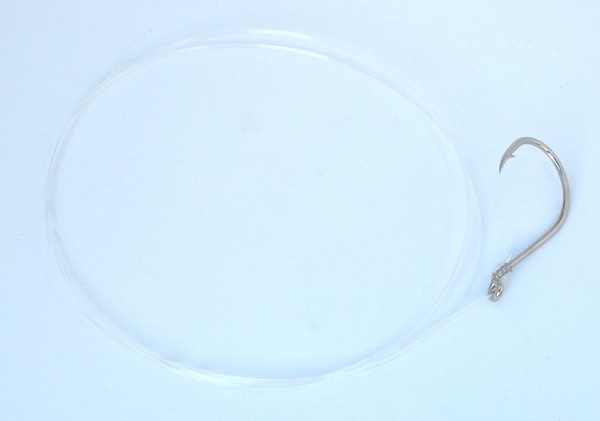 If you prefer to rig your own, you can puchase these hooks from our Fly Tying Materials Catalog. Diameter of the #4/0 popper face is 5/8 inches (16 mm)...total length of this fly is approximately 5 inches (12.5 cm). Diameter of the #6/0 popper is 3/4"; length of the #6/0 fly is approximately 6 inches (15 cm). The Bluewater Mirage Tube Popper is tied by Taylor Topliffe. Click Here to read about the spring squid run in New England, one of the unique inshore situations that this fly was designed for. Similar fly patterns: Bluewater Banger.